“Will you sing it again when we reach Rohan?” He asked quizzically. The shieldmaiden then glanced over to the Eistaron and whispered a thank you. He must have sensed that the two women needed some time alone. When the room was finally empty of all except the two women, Eari finally spoke through her tears. "Who would have known?" She looked at Rholarowyn. "You were my friend, my sister before I knew of love. But love has now brought me twice into... your family." Rholarowyn nodded in agreement. Love had found Eari twice and each time with one of her cousins. While Rholarowyn still could not understand how her friend could have fallen for the womanizing Rohirrim, Herger, there probably many were more who would not attempt to understand how she had fallen for a man from the East, and was willing staying with him there for all those years. She chuckled again; she fought her heart for so long before she finally gave in to the feelings. For long she believed that love was the privilege or the curse of women and she never thought of herself as such. For long she had hesitated to follow the path of her heart. In fact, she had fought so hard... losing Boromir cut so deep that she had long refused to be entangled in the feelings again. Why get hurt some more? But her friend was right; once love was experienced, there was no going back. "Did you fight it? That feeling there is no going back to what life was? Or did you embrace it?" Rholarowyn looked down and began to scrape at a small flap of dried skin on her thumb. Stubbornly it refused to scratch off. Eventually she abandoned this pursuit and returned her gaze back to Eari. “I know how you feel about the East, about how most people feel about those in the East but not all are like what we’ve been told. Honestly, after what happened to me, I don’t know that anyone in the West could have truly helped. At least the people of the East know what those of the South do to their captives. They understood… I, however, did not. I did not understand their language, I did not know their customs, and in the early days they had to keep me sedated because I didn’t understand they were trying to help me.... I thought he was only being nice to me because I had helped to save his brother’s life...or perhaps he felt sorry for me..."
A momentary glaze had passed over her eyes but was quickly replaced by a light and a soft smile. As Rhoe moved to settle more comfortably so did she. There was so much that had happened since they last met and that night in the village had not been enough. She had always struggled with the idea that her friend was dead, but now that they were actually together and talking, it seemed she could not get over the mere fact that her friend was alive. Sitting on the bed facing Rhoe, one leg tucked under her and the other one hanging on the side, she listened to the one she had called sister tell her story: and not an easy one. She felt her heart tightened as she heard her sister was in that terrifying place where nothing but death makes sense. And she was there without anyone she knew or loved to help her. Eari only now had an inkling of memory of what women endured there; what did her friend go through that would leave her so broken? What perversity did they inflict upon her? But she could not bring herself to ask; it would not be fair to her friend and to be truthful she was not sure she could handle the answer, not after what happened with Ryomer and Anoriel. They abandoned Rholarowyn to a fate darker than death. No they sent her there; they had to know what she would face. How could they have done that? Why would they? She understood that longing for death's embrace when the suffering is too painful to bear any more; she felt it too years ago and for a long time. Anoriel feared she still had it in her. She shook herself; this was not about her. That caused her to smile softly and reminisce. It all came down to that did it not? In the end, people saw what they wanted in others... and acted accordingly. "And he probably did... There are those who seem to be able to do that sometimes." It was her turn to hesitate. "I may not understand the East Rhoe, not as you do. Maybe I never will. But I do understand how someone who sees you as whole when you don't - no when you can't - can be healing." She paused... and for a moment she talked to her lap. "I am sorry you had to go through that on your own." Well that was not entirely accurate obviously as there had been people with her but she had been without the ones who should have been there. "But I am glad... that you found someone who could be that person for you." Meeting her friend's gaze again, she smiled softly. "What happened then?" "I am not commenting on your competency. It is only..."
"Alessan..." Anoriel interrupted without force. There was no point in increasing the tension in that room. He was not going to allow another internal conflict. This group would not survive it. Lienoril had a point. And if there was no way to predict how the peredhel would react when she actually remembered what happened in the East, he needed to make sure that they were prepared. Alessan looked at him, paused and nodded. He knew she wanted to help all of them; she was an extremely good healer and had a knack to see things that others did not. What she said about the peredhel seemed the only possible explanation in hindsight, but there was no way to turn time back. And Alessan could not become part of the issue; he needed her to bridge the gap with the women, not expand it. As she opened the room to leave, Alessan turned to Ryomer and added gently. "Make sure you drink that other glass within the next hour." Once the healer closed the door, the men's gaze rested on him once more. There was the case of the peredhel to address. "I had a discussion with Earendil; she understands some of what we need her to do and why. She agreed." He heard Sintarano's snort and added. "She pledged the oath of Gondor. And we all know what that means to her. I will ask though that you do not test her boundaries with regards to her memories of the East. We have no way to know how she will react when she actually remembers." He had not anticipated the changes in the two women; of course ten years changed people. And motherhood too apparently. He was not sure he could understand what these women were going through. They were not soldiers in the sense they once were; other things came into the pictures that none of them could guess at. Maybe a married man with children would have been better for this. "I have dispatched some messages to Minas Tirith, Edoras and Dol Amroth. Until we receive answers to these, we are headed to Rohan as originally planned." He turned to Lienoril. "Unless the encounter with Zochella changes things?" He had had no chance to speak with the Gondorian but since he wisely advised they regroup, Anoriel might as well give him the opportunity to show what he was made of. “Zochella changes nothing.” The Gondorian stated firmly. The note, now crumpled, was carefully folded and tucked deep into an inner pocket of his stained leather tunic. He had looked at it only one other time after Rholarowyn had brought it to him that night back at Daenora’s place. Neither he nor the shieldmaiden had brought up the subject since that evening and only he and the shieldmaiden knew of its existence. “I’m not sure, she did not talk to me, she talked to Rholarowyn.” He answered with mild annoyance. “Is it possible she was not threatening you but instead giving you a warning? It could explain why she didn’t make contact with you directly.” Sintanaro added reflecting on the earlier conversation. “Look!” Lienoril began with an edge in his voice. “There is nothing more here than that red-headed woman wanting revenge for some perceived injustice from years ago.” The Gondorian then looked to Anoriel and wondered if he too was remembering the conversation they had shared with the seasoned sea pirate in that shady, shoreline tavern just over a year ago. It was a tale of treason, treachery, and greed that had overtaken the female captain of the seas. Lienoril looked at him askance... there was much unsaid here. A tale of the past, a past not so long gone since only a year before the red-haired woman's name was brought up. He remembered a discussion with another pirate; Zochella's story was not a happy one but for all the heartache of it, he found it hard to feel sorry for her. Still, she was part of Lienoril's life and his in ways that were difficult to explain or even understand. He was not entirely convinced that was the case but he would leave it to rest for now and nodded. "We have to assume the men who were expecting Earendil in Tharbad will be looking for her. They may not be searching for such a big party as the one we will now have but who knows what information they have managed to obtain. The two women can fight but regardless... should we encounter any trouble, two of us for each of them. They will want us to make sure Nayaran is safe so potentially four to protect the child and one to stand by the shieldmaiden." Anoriel was not sure whether Alessan and Eistaron would join them, but for now his priority was to make sure the two women and the boy made it to Rohan. He looked at Lienoril. "Whatever happens I need you to stand by Rholarowyn," the two seemed to have created some connection, "Dewelgen; she's your charge too unless Nayaran's safety becomes a concern. Sintarano... Earendil." The man nodded. "Tyrelles... Nayaran. Ryomer, Earendil or Nayaran." He knew it was much to ask but the peredhel was capable of defending herself and until the Rohirrim was better Anoriel would not take unnecessary risks. "Now, this was the path the King and Bryttar advised us to travel..." He pointed to the map laid out on the table he had used as a desk. "You are all more acquainted with these regions than I am. What are our options should anything force us to a detour?" Rholarowyn remained silent as she reflected on the days of long ago. Finally she found herself alone with an ally, her warrior sister and one she did not have to censor herself, much. Other than one binding, secret oath she had made to those who had rescued her from death, for the first time she could be open with her story. The sheildmaiden slowly began. “When I was imprisoned there were others with me, though I was the only woman. There was a man, the first born son of a Chieftain whose tribe was fearless and though they were a reclusive tribe who lived deep in the high hills, many feared them. This man, he could speak Westron, and for reasons I do not understand they held us captive together. While at first I did not speak to him he spoke to me…he had been there a very long time.” The shieldmaiden stopped and gathered herself. Rholarowyn paused again as her stomach tightened with the familiar knot of fear. Though safe here in the room, just the retelling of the past could spark the feelings from those days of long ago. Quickly she moved on as she looked down to her hands. Lienoril knew that the discussion about Zochella was far from over, too much had happened between the three of them and she knew their strengths as well as their weakness. Both had fallen victim to some aspect of her charms though each man in a different way; however, shifting to the map was a good diversion. Perhaps later, but before they departed, he would share the note with the leader, then again perhaps not. The Gondorian moved over to the map along with the others, yet Ryomer remained in the bed drinking the concoction left by the healer. The pain in his head eased with ease sip. “We are further south than they expected…” Sintanaro announced. “That route can be treacherous though with the spring thaw a few months ago there should be very little trouble traversing the higher elevations.” Dewelgen added. “And taking the southern route to the Gap of Rohan, even if we remained against the base of the mountain ridge would leave us more vulnerable. Anoriel, do we have enough strong horses for the mountain pass?” The Gondorian asked keeping his eyes fixed on the map and purposely off the leader. Lienoril was not looking at him as if it would force him to face a past that he did not want to remember. The Gondorian was not so different from the peredhel in fact though telling him that would probably not help. "I guess it will depend on how many is enough by your count... but we have strong horses and we can travel with one for each rider plus one or two pack horses. I cannot speak for Earendil's and Rholarowyn's mounts but my guess is that neither will want to leave them behind." And that was one fight he would not pick; there might be many battles of will ahead between the men and the two shieldmaidens but this was one that need not happen. Now he knew the maps, had looked at them; going through the mountain pass to take the Dimrill stairs meant that they would ride South to Rohan. They still would have to ford the Limlaith at some point which might prove tricky and continue along the length of the Fangorn forest to reach Rohan from the North. It would be longer but as the men mentioned safer unless someone found their trail, which was always a possibility. "So Caradhras it is. Let us hope the mountain will be kinder to us than it was with the King and the Ringbearer." It was winter when the nine walkers tried to pass the cruel Caradhras but all knew that the mountain was capricious and even in summer it might be treacherous. "Let's be prepared to ride tomorrow or the day after." He knew Alessan would not let Ryomer ride before the next day but they needed to move fast. It should be enough time to prepare all that needed readying. "Lienoril?" Rhoe's seemed to fight a barely repressed fear for a moment as she looked down at her hands. There was still so much suffering; her friend might have been shuddering. But she did not interrupt her trail of thoughts. She needed to know that she could talk in her own time; there was nothing forced or obligatory. To stop or to continue it was Rholarowyn's choice and she would accept it. Sometimes silence was the only answer and so the peredhel kept silent. She only lay her hand on her friend's trying to convey as much comfort as she could. The sadness of the tale cut deep though; how far did these men go that one who was a leader among them was broken? Maybe she did not want to know; maybe it would come too close to what she did not wish to remember. But whatever her friend would share, she would hear. And however it was that this happened, her friend found someone to help her through the ordeal and she helped him too. “And which hand would that be?” Sintanaro leaned back in his chair interested in this new piece of information. The dark haired Gondorian looked from man to man until his eyes rested on Anoriel. He was inclined to agree with Lienoril; this place was not safe enough and he knew in his heart that the people searching for the two women would start to look outside of the city, sooner than later. Could they endanger this place? Not much longer... But he had not expected the man to admit that Zochella had something to do with it; not after he just denied she was potentially cause for trouble. But it seemed Lienoril was coming to realize what he learned before; things don't always develop the way you intend them to. Still there was no point in putting him on the spot for that. So he ordered the others out before Lienoril offered the information he had: a rather cryptic message it turned out to be. One had to acknowledge the woman had a poet's mind but she was ever clever with words; it saved her more than once and caused the death of others in turn. He recognized the barely veiled threat behind the words but he had to admit he did not know what else it could signify. The other man shook his head... Maybe Lienoril did not understand more than himself. Or he did but if he knew he was not going to tell just yet. It was quite alright. It was however enough to make the decision. "Well it seems we will have to make sense of this but on the road. We leave within the hour - two at the most; we need to put as much distance between us and this house as we can. Ryomer, you will leave in a day or two with Eistaron." Standing by Lienoril he pointed somewhere on the map twice; the first time the Gondorian nodded, not the second time. Lienoril put his finger somewhere else. Yes it made sense. He took the map and spread it on the Rohirrim's lap as he sat on the chair Alessan occupied before. "If both groups make good time we will meet here in..." He showed Ryomer the first place on the map that he had just identified as Lienoril spoke. "Four days. We will go slower with the boy." Anoriel nodded before looking back at the man from Rohan. "I hope you can leave Alessan here; it is not a road she can travel, not anymore. But she can be stubborn. If she is to ride with you, you will have to go slower; and it is best to be prepared... If we cannot meet at the first, we will meet there..." He indicated the spot Lienoril marked "in seven days." The tranquil silence lingered in the room as the two warrior sisters remained on the bed. How Rholarowyn’s soul had longed for this day, this moment, when she could sit in the presence of an old friend and feel acceptance over judgment. It was no surprise that she was sharing these moments with Eari; with their past could it have been any other? Suddenly the wooden door flung open and the two young boys were rushed inside. Both women were instantly off the bed and on their feet. Eari and Rholarowyn moved in unison as they slid the plank into its proper place with a thud and waited. The two boys moved back by the bed while the woman grabbed their weapons of choice. Meanwhile, the two new arrivals dressed in ragtag clothing had not gone unnoticed by the others and within moments of being spotted, Anoriel and Lienoril had been informed by Dewelgen. The Gondorian moved instantly to the window and the leader was by his side. They both observed the uninvited visitors as they slowly approached the houses. “Friend or foe?” Lienoril whispered to Anoriel. "Friend or foe?” Lienoril whispered to Anoriel. Anoriel shook his head; he did not know. It could be nothing; after all Goronor and his wife had taken part in the village life. He was not at the wake, maybe these were coming to visit his widow, reassuring themselves that she was well. In fact, she walked out of her house to meet with the two men as any lonely woman would do trying to ascertain the visit while her child remained inside. She held her head up high and there was pride on her features; her garment proved she was a woman in mourning and it should prompt the two visitors to show respect. Still a quick glance sufficed to notice that Sintarano and Tyrelles were on either side of the two riders bow in hand ready to shoot if they proved to be thugs preying on a newly widowed woman with apparently no protection. Still he saw both men as they took note of Eistaron who had just come out from the house where the shieldmaidens had thankfully remained hidden. Words were exchanged that he could not hear; he would have given much to have the peredhel with them... The woman did not seem to react to what the man spoke of at first and after another sentence she only shook her head no. One of the men got off the horse and took the woman's hand as if to give her something. There was a sudden tension in the woman's posture; he started moving towards the door.. And then he saw them. "By the Valar! What are they doing?" The two shield maidens had left the house and an arrow was flying off Rholarowyn's bow hitting the man who was holding Goronor's widow's hand in the shoulder causing him to step back dropping a knife Anoriel had not seen. Within a moment another arrow was knocked and directed at the second man's heart. Earendil had moved past Eistaron, her curved elven sword in hand and anger in her eyes. Anoriel was out in an instant Lienoril on his heels as Sintarano and Tyrelles revealed themselves. The man on the horse swore but could not turn either as Dewelgen stood in his path arrow trained on him as well. "Captain! What are you doing?" He called after Earendil. Whatever it was she knew he could not risk revealing her identity. She knew he spoke to her; he could see it in the way she paused even though she decided to ignore him. Instead she spoke to the rider. "Get. Down. That. Horse. Now." The man looked at her, eyes widened in shock. But he complied. What was going on? The unharmed rider appeared to be fairly young; in his late teens maybe but no older. He observed the other one... he had not seen many more springs than his companion who was now standing by the peredhel not even an inch taller than her. What had they come here to do? "What is your name?" The peredhel asked coolly. "Shut it." His companion whispered angrily before closing his mouth quickly when the peredhel looked at him. Where had she learned that gaze? She turned back to the younger thug. "What made you think you could attack this place?" "Them at the village said this ma'am lost her husband a few days ago... we thought she be on her own." "That does not answer my question?" The young man looked like a boy who is being chastised for a mistake. "We need the money to get by." "And stealing it from a lonely woman is acceptable to you?" “My arm!” The older thug protested. Without saying a word, Sintanaro reached up to the arrow shaft still protruding from the young man’s shoulder and broke it off close to the wound which was oozing blood. “Dewelgen, get their horses.” Anoriel ordered. “What?” Lienoril protested as he suddenly had a bow and arrow thrust into his hands. Rholarowyn slowly walked over to one of the horses. Gently brushing aside the mane of she smaller, red horse she first examined the tack and then let her hand glide slowly down the gelding’s left front leg. With gentle pressure on the correct spot the horse easily lifted his foot. “We have a problem…do you see this?” She asked to those still near. The two women answered in unison and after retrieving her bow, both made their way back to the guest house which was still being guarded by Eistaron. Both she and Rhoe went to move back inside; Anoriel had to realize that they would not have come out without a good reason. She was not in the habit of disobeying a direct order, even less so when she had given her word she would do what was asked of her. But she could not stay in with Goronor's wife being in danger; Rhoe did not ask any question, she believed her without hesitation. She had not expected it to feel this good: after days of second guessing everything it was comforting that someone did not doubt her. She was impressed how much better her friend had got with a bow; and she was already quite amazing last Eari saw her shoot in Minas Tirith. It seemed that ten years had not changed her friend's dedication to that particular art. Still a fight in a place of mourning was not a good thing. Realizing something, she turned around for a moment as she passed Eistaron. Goronor's widow seemed a little shaken; so much in fact that she had not moved an inch since the man took her arm. That poor woman appeared to only be an afterthought for the soldiers and even herself. In her own house and after the loss of her husband that was not right. She caught Eistaron's eyes who nodded: not an afterthought after all. The man would look after her; good. They also did not seem to have expected a peredhel to be there since the man lied to her face even with a sword on his chest not realizing she had heard the threat they proffered to Goronor's wife. Who could have put them on a such a wild goose chase? Or were they given a false pretext to track someone - Rhoe or herself - for another party who was about to fall upon them while they worried about these two pretenders? They needed to leave NOW! Could Anoriel and his men not see it? He probably did; she just was tired of being told to sit tight and wait. It was not who she was nor what she was. She turned towards her friend about to tell her to gather her things as they probably would leave soon but it seemed Rholarowyn had come to the same conclusion. They would be riding out sooner than later. It was just a quick moment in time, a flash of a second but it took no more. She and Eari, together, armed with a common purpose, protect the good, destroy the evil. Each cell in Rholarowyn’s body suddenly remembered times from long ago. Journeys, errands, missions, she and her warrior sister had shared. Neither had spoken a word to the other when a threat reared its ugly head on the innocent widow. There was no pause or hesitation and if it hadn’t been for a last minute check the shieldmaiden would have pierced the man’s heart instead of his shoulder. Now the two were ordered back to guest house and after Nayaran’s young friend had been escorted out, only the two women and the boy remained inside. It took only a moment for Nayaran to see the two women packing and he too began to gather up what few belongings he had but then stopped. “Who?” Her warrior sister replied. She understood her friend's feeling all too well; she had felt the same way for days now. And as tamed as one might think she had become in the ten years gone by, she was not used to being ordered around in this particular way. Still she had recognized that it was their way to protect her, no them; they considered Rholarowyn and her as women before they were anything else. They still thought that ten years had turned them into the women they should always had been: weaker, more fragile. Ones to be taken care of unlike soldiers who can look after themselves. It was annoying but she could not make them change their minds. Neither could Rholarowyn... At least not with talk. Anoriel... can we trust him to get us out of here... and then safely to Rohan?" That was a fair question and one that required a longer answer than she had time to give. It would mean she had to explain to Rholarowyn what she started to understand while speaking to Ryomer near Tharbad. And though there was no need to bring Rholarowyn to the truth of their situation in such a delicate way as the Rohirrim tried for her, it still would be a long tale. It also demanded an answer that she was not willing to share with her friend while the boy was there. What she did to Ryomer a couple of days ago was too vivid a memory still that she could walk that path again. And so she gave a response, which was both one and not. "I once trusted the man he was. I have realized that I might not have returned from the East but for him." Her eyes flicked towards Nayaran briefly. "I trust he will get us to Rohan whatever the cost to him." As of right now, the cost was probably the trust of his men - because of what she did. And a group plagued with doubt was more likely to fall prey to enemy... she sighed. Lienoril opened the door before she could finish her sentence. “We’re leaving, now!” The Gondorian barked with an intensity etched on his face that Rholarowyn had never seen before. Leather satchels and weapons were gathered by all and less that a minute later Eari, Nayaran, Rholarowyn and Lienoril where silently waiting on the far side of the guest house. The air, which would usually be filled with the songs of birds, was oddly quiet. Though not in this land, Rholarowyn knew these moments too well. Once again there would be no goodbyes or appreciation expressed to the family who had suffered so much in the previous days and yet had graciously allowed refuge to her and Nayaran. As for hope, Earendil had just begun to speak of what it was she hoped for in all of this but, Rholarowyn did not miss that her answer about their current leader was filled with some degree of anxiety and trepidation. Could the man be trusted? Perhaps the next few days would answer this question. Lienoril stood close, with his right hand resting on the hilt of his dark sword. “Get ready…” was the only explanation they were given just before a small herd of horses charged the corner. Sintanaro was mounted on his large chestnut mare and held the reins of the other 3 horses in his bare, left hand. Earendil gathered her reins quickly and was upon her mount with the usual grace of an elf while Lienoril swiftly placed Nayaran upon his own steed. Before progressing further he carefully pulled Rholarowyn aside just before she could grab the leather reins of her own horse. The man had a firm hold of her arm and leaned in hard as he moved his mouth next to her ear. The shieldmaiden turned towards him. “You, Lienoril, do not understand.” Her voice was impersonal, unyielding, and filled with resentment. “Nor do you.” The Gondorian threw back before releasing the woman’s arm and shooting a quick warning glance to the dark haired man whose eyes remained fixed upon the blonde haired woman who instantly mounted her dark mare. Nothing more was said as the group of five continued to ride until well after nightfall. There had been the usual short stops for watering the horses and allowing them a brief rest but now each one sat in their darkened world of silence. There would be no fire to warm their chilled bones on this unusually cool, summer evening and the only answer for the hunger gnawing in their stomachs was the small bit of cold cheese and bread they still had. Their evening refuge was located in a small rock outcropping which overlooked the direction they had traveled in the afternoon. With a motionless signal Lienoril and Sintanaro both finally rose to their feet, moved toward the ledge, and beyond the range where they could be heard by the two women and the now sleeping boy. “When are they supposed to meet up with us?” Lienoril asked gazing at the blackness below. The curly haired man immediately raised his hand up as if to stop the next words from penetrating his soul any further. Lienoril's intensity was only matched by Rholarowyn's cold tone; whatever lay between her and Sintarano, it ran deep. Deep enough that the Gondorian shield maiden had never mentioned it to her. This was going to be a challenging trip if none were capable of trusting the other. She could only guess at the reason for their abrupt departure but she knew Anoriel would not let them go their separated ways unless something was really wrong; and so she found herself worrying about what it was that they had found about the two intruders. Still she would not ask; neither Sintarano nor Lienoril trusted her at this point and neither would answer any question she'd voice. And the tension was palpable; they needed to move fast. They would not accept any interruption or doubt to what they did just now. And it was fast indeed; they only stopped to give the horses a semblance of respite but not to the riders. Eari was impressed again by Nayaran's resistance; he seemed to just accept the situation and make the most of it. He had the making of a strong man... He did not complain as they rode long into the night, neither did he ask for anything when it turned out there was little to eat and even less to cover themselves with. It would be a dark cold night. She pulled her own cloak tighter trying to shield her body from the chilly wind. The night would not be comfortable for them, whether they tried to sleep or not. As the two men walked away from them, Eari threw a glance at her friend. Rholarowyn sat by her son sharing some of her body warmth with the now sleeping Nayaran. "He is a courageous boy," the peredhel whispered. Rhoe's gaze rested upon her; despite the darkness she could see there was pride in her friend's eyes, and yet something that resembled sorrow, maybe that he had to be so even though he was still so young. It was unfair. Still Rhoe nodded though she said no word. In the silence of their companionship, Eari could hear the two men speaking even if she was not trying to listen. Whatever prompted their departure, Lienoril did not know either and it seemed Sintarano would not tell him. It was concerning; in fact it worried them enough that neither intended to sleep as they both planned to stand watch. That was not right; they should share the duty. It was the only way they could continue until Anoriel and the others caught up with them. The mountain cold would tire them more than they seemed to anticipate. Lienoril should know better growing in Minas Tirith at the feet of the White Mountain; Sintarano, she did not know where he came from. Regardless, tired they would be more likely to fall prey to the bite of the wind or worse miss any obstacles that could appear in their path. She took a breath as they came back to sit at their cold dark campsite; she hesitated. Should she say anything? They needed to realize two things: first that they could not walk a few yards away and expect her not to hear what they were saying - there was no hiding what was going from her - second that they could take care of themselves. Finally her hearing might be useful. So she spoke. "Lienoril you have to let us stand watch while you and Sintarano take rest. We are not ladies without skills. And we all need our strength. You two as much as us. Maybe even more so if you are going to stand between danger and Nayaran." That was the only thing that made sense. One man would have been enough to ride with Rhoe and herself, but with the boy who was an unknown in terms of defensive skills they needed two. The two soldiers looked somewhat shocked for a moment. They *had* forgotten that she was part elf and as such could hear them unless they took a long walk. Bitterness warred with humour: they still really thought of them both as gentle defenceless women. But what remained at the end and as she spoke was caution and, to a certain extent, guilt. The Gondorian seemed to be about to say something but she cut him off. "Look the mountain can be dangerous even at this time of the year. And I will not be responsible for another of Anoriel's men being hurt. One is enough; it weighs heavily enough on my heart." Both men exchanged a look as if they were considering her offer. Or maybe they were wondering how to tell her to just do as she was told. What right did she have to say anything here? She shook her head; constant self-doubt was exhausting her and she could not seem to shake it off since the events that led to Ryomer's wound. She was a Captain of Gondor regardless of the fact that she had not commanded anything in years... yet here in the coldness of the night, she felt as only a woman who had become a burden to the people who were supposed to protect her. She'd have screamed in frustration if she had not known how discretion was crucial at this time. Finally someone shattered the heavy silence. “What she says is true.” It was Rholarowyn who had finally broken the silence. It had not only been her words but the reflection upon those words that had finally found a long ago buried part of her soul. Nayaran had courage and in that sense he was like his father. A trait that needed to be developed or one could perish in the blink of an eye. There was no place for giving into one’s fears in Land of Sands for they could be beyond treacherous as Rholarowyn had once learned. However; she had never regretted having her son or marrying his father. Not only had he helped her recovery from the abyss of darkness, but he had been a true partner in the raising of their son and it was from him the foundation of Nayaran’s courage had been instilled. Despite throwing herself into the arms of another man a few nights before, the shieldmaiden still carried the grief of his death. Yet Eari’s words were surprisingly comforting. There was an acceptance of her son and it was not until her warrior sister had spoken these words that Rholarowyn understood how she had longed to hear some form acceptance for the life she had chosen and in this moment the shieldmaiden found her voice. “Enough!” It was Lienoril who now stood tall and whose voice thundered with authority. Nayaran stirred with a jolt and rolled over with his eyes opened wide. Rholarowyn quickly gave him a soft touch, a signal that was known only to them as a silent indicator that all was alright despite how things appeared. The Gondorian was inches taller than the curly haired man and used his height to regain control. “Take a breath since I speak to you as well. We do not have time for petty grievances and long held grudges from ages past. If we cannot keep ourselves focused on the task at hand then the enemy has already won no matter what path we take. Eari suddenly leaned into Rholarowyn spoke slightly above a whisper. "Rhoe wait… someone's coming." Sintarano seemed to be losing it though; whatever he saw before they left apparently pushed him over the edge of caution and he started yelling, something she had not done. But there was no telling him to tune it down. Still she could almost hear the echo of his voice surround them and project much farther than was good for the little group. Something caught her attention in the distance: hoofbeats, suddenly overwhelmed by Lienoril's thundering voice. There was something, a whistle, but it was drowned in the men's voices. They had to stop being so loud... Two horses being led extremely cautiously as if the riders were cautious to not to bring attention to themselves. Not here; it was not a good place enough to hold for long. She leaned onto her friend, the only one who would listen to her right now. Her friend was armed before she said another word and within a moment so were the men. She on the other hand did not pick up her sword and as Lienoril placed his hand on her arm as if he were to ask something she raised a finger. Don't she mouthed without a sound. There it was again the whistle; a bird chirping. That's what she had heard, but she should not have heard that sound: not here, not at night. That bird was from the South never to be found this far North and definitely not in the mountains or flying in the night. She relaxed her stance somewhat and brought her hands to her lips before mimicking the sound she'd heard. Rhoe's slight gasp beside her could have been of surprise but most likely recognition; she had heard this before. Lienoril breathed out as he lowered his own weapon. Another response... She was not sure they heard it yet but she most definitely did; and there was only one person this side of the mountains who seemed to remember she could hear it. "Are you sure?" Sintarano's voice was almost flat but she could hear the underlying anger of his outburst. She did not want to antagonize him but he had to stop this. "I am." she replied quietly but firmly. If Earendil’s senses were correct, whatever was coming, and coming soon had still not arrived a few nights later. Anoriel had pushed the group hard over the previous two days along with demanding silence in all but the necessary moments. Furthermore the two women and the boy were never to be alone at any time, ever! The sky to the east was just beginning to shift from the blackness of night. Rholarowyn was perched upon a high rock that overlooked a narrow canyon, though the crevices were still shrouded in darkness. Lienoril was beside her and both had their swords drawn and ready if any action should they be needed. Understandably it was either the Gondorian or Anoriel himself who had been paired to the shieldmaiden since the leader and Eistaron and caught up to them. Whether by order or by choice Goronor’s brother and Faramir’s one time, second-in-command had only spoken to her once and that awkward discussion had only concerned Nayaran and the returning of the Elvish blue stone that the boy had temporarily given Ryomer. Ryomer she later learned would not be rejoining them and whether Rholarowyn trusted the leader or not, the intensity of his countenance conveyed that she and the others had best hold to his plans. The tension was obvious; his standards and expectations high, there would be no room for mistakes or error. Also, wherever he was leading them, she, Eari, and her son were expected to willingly follow without question. “Go wake Earendil…” Lienoril whispered into her ear just after the first birdsong began. “…and let her know what our destination shall be.” The shieldmaiden eyes quickly turned on the Gondorian, though she spoke no words. He had shared their destination in the stillness of the night many hours ago, though she still did not believe it. His only response to her hesitation now was a nod and a tilt of his head indicating for her to move off. Finding her feet she easily made her way off the ledge and over to where her warrior sister and son slept peacefully, at least they appeared to be. Eistaron and the leader were off a short distance away under some stunted pines and engaged in a quiet discussion while Sintanaro too was asleep upon his bedroll. Silently, Rholarowyn knelt down and pressed her hand down upon her friend’s shoulder in a series of three gently pushes. A silent signal they had developed many years ago. Whether Eari was asleep or only resting her eyes the dark haired warrioress slowly turned her head upwards and opened her eyes. She'd been wary; it had been a few days and nothing had happened yet but she could not shake the sensation that something was coming. The feeling clung to her and would not let go. Anoriel's intensity did not help; his entire attitude was one that forbade any questions. And she had not asked any, much as she wanted to. She had done as told, resting when ordered to whether she actually slept or not, keeping watch when needed. She also resumed relying on others though that was not entirely easy with the tension still palpable within the group: some things came back faster than others. Now lying down close to Nayaran while Rhoe and Lienoril were keeping watch, Eari could not rest not easily. They were following the foothills heading towards the Redhorn Pass and passing over the mountains would be an ordeal for all of them. Spring was behind them but the Pass remained treacherous; what if? A sound came from the side and a hand on her shoulder pressing three times cut her trail of thoughts. She opened her eyes to look at Rholarowyn whose gaze held nothing but concern. She sat up faster than she needed to. Moria! She might have wondered at the man's choice but it made sense in fact; if anyone was following them as Anoriel seemed to fear, the Mines would be the best place to lose them. The dwarves would not allow anyone in that they did not trust. But why would Durin's folk let them in anyway? They mostly kept to themselves even though the alliance with Gondor was established. So many questions that neither of the shieldmaiden could ask yet. So she moved... and soon they were on their way, Anoriel leading the way and Sintarano closing their march. Walking in silence the sense of uneasiness that settled over Eari a few days prior intensified. Something was wrong... She stopped standing upright and listening to the sounds of the day. Something was disturbing the place. She shook her head; she was worried about the mines. And yet. "Move," Sintarano whispered to her as he caught up with her. But she could not. Something held her rooted in the spot she'd stopped at. "Listen." She answered. The man looked at her obviously torn between annoyance and worry. "What?" She could barely hear it herself and yet she was certain of it. "Someone's near. And they know how to move silently but they're still disturbing the balance in here, more than we are." He looked down at her before he nodded thankfully. She nodded back and both caught up with the others. She let Sintarano speak to Anoriel... the scarred leader gazed at her hard before he too acknowledged her warning. They moved fast then, as fast as the treacherous path would allow and within the hour they reached the outskirts of the lake that bordered the entrance to the mines. That was when she heard it now distinctively. The pebbles falling, the voices... still behind but not far. And though she did not speak the language nor understood it, she knew it. She tensed and drew her sword. As if he had heard it too, Anoriel had his weapon in hand within the same move and soon all of them were ready. If they were surprised to see the group prepared to fight, the men who had tried to sneak upon them did not show it. And even prepared they might not even prevail; there were eight men, two of them massive. It was not a good place for a fight, but they had no choice but to engage the Easterlings; so they did. Last edited by earendil81 on Tue Apr 16, 2013 7:43 pm, edited 1 time in total. Nayaran knew his part. Armed with a small dagger and knife, at the first sound of battle he was off Lienoril’s horse. While the location may not have been good for battle it was extremely useful for slinking away into an unseen crevice and disappearing into nothing. Rholarowyn remained mounted and positioned at full draw, maneuvering her horse through the maze of both rocks and enemies. One arrow found the enemy quickly and once reloaded was about to loose another when her mare stumbled hard. Protecting herself as best she could required releasing both bow and arrow and rolling her body into a tight ball to soften the impact of the landing. Once stopped there were 2 pairs of hands, one on each side, eager to remove her from battle. Her scream was met with a fist to the face then the coarse hand smothered her to silence. The two men from the East began to drag the woman away from the scene, away from the battle, and away from her friends and son. She fought with every ounce of skill and experience she had to escape the hands that now held her captive yet the men were also skilled in the ways of the East and countered her attempts with wicked doses of pain. Some time passed before they brought her to rest in a small shallow cave and once bound; the two dark men gave her a crude warning in the dark language of the East. Then all went black. When finally her eyes opened, Rholarowyn, lying on her right side, noted the light and the darkness nearby. Shadows had shifted, clues that it was no longer mid-morning but now mid-afternoon. Her head ached with a pain that was disorienting, but the woman had enough sense to search for sounds, any sounds that would indicate an ongoing battle or a a much hoped for search party. Instead there was only the silence of the winds to answer her inquiry, that and the subtle breathing of one sitting nearby. Carefully the shieldmaiden turned rolled onto her stomach and carefully lifted her head. It was then that she met the dark eyes of one she had met before. His long oily hair clung close to his smudged Easterling face. His dark, black eyes were filled with a haughty glow of victory. “We meet again…” His raspy voice whispered. His breath stunk of the intoxicating drink of the high desert plant, but the woman did not turn away. Again he spoke in his gruff low voice. “Remember this?” He then asked reaching under his tunic. From the tattered rags of his red shirt he exposed a charmed necklace. A leather cord pierced beads of gold and precious gems. “Of course you do!” He answered as a crooked smile crossed his face. “You failed…but you already know this...” he then laughed. Rholarowyn watched as his eyes went wide with a momentary recognition. His grip slowly released the prized leather band around his neck and his hands slowly slithered to the ground. His body then followed and the shieldmaiden watched as the pool of blood grew while his life-force lessened. The blade of an axe now embedded in the back of his head contained markings of Durin’s folk. She was off her horse within moments; she was useless with a bow unlike her friend and Anoriel who both disposed of one man as she engaged one of her own. It was intense and she needed it; she fought the man as if he were everything she hated, and maybe he was. One move, another, and some more. "Eari kill him," she heard Anoriel call to her. She knew he was right but she could not. There was too much. And then she saw it, from the corner of her eye, Rhoe being pulled away by two of their attackers. "No!" She yelled... She did kill the man then with one swift move and strode fast as she could towards her friend. But one of the massive men blocked her way; anger threatened to overwhelm her and she knew she should not let it. "Anoriel!" She could not turn to see where the other men were for the Easterling struck at her with a blow so heavy her arm shook under the strength of it. Soon she could only concentrate on what the man's attack allowed her to do. He was taller, stronger than her but she somehow held her ground. It seemed suddenly as if she were practicing with any other man as she had done a thousand times before. She'd always been shorter, slimmer, she always had to rely on her speed and having to be more clever to get through. So she did and her universe seemed to shrink to the man and herself, the movements of his arm, the way his sword danced about him. She heard voices raising about them in another language that she had not heard in a while; only this one she understood somewhat. Khuzdul. She called out. "No! He is mine." She knew they could take care of that man but no; if they had come for her, then she would give her answer to this. The Easterling greeted his teeth and he came towards her once more; the blows came heavy, but not as much as before. Still they fell hard. When she finally caused him to let go of his sword she had for a fleeting instant the sense it was done but she was oh so wrong. The dwarves had come out moments before and would have killed the Easterling with one throw of an axe, but the woman made it clear she did not want anyone to intervene; he knew what she was doing and it was probably not going to help her. She was trying to atone for sins she had not committed; he had seen it in her eyes since she wounded Ryomer. She was doubting her ability to make the right decisions and he had not helped. She would have alerted them earlier about the attack if he had spoken to her and yet he knew he could not have prevented this. Time froze as the man let go of the sword and used his own hands to unarm the peredhel. As long as he was using the weapon she stood a chance; she had remained sharp and good. Better even... but when the man used his own body, she could not hold him, he was too tall and strong. He grabbed her wrists ignoring what must be agonizing pain in his hand. The blade was cutting his palm but he forced the peredhel to let go of her sword before grabbing her an arm around her neck, the other holding one of her arms behind her back the other stuck between her body and his. Sintarano and Lienoril moved towards the two fighters. Anoriel looked at the woman whose eyes were veiled with something he had already seen in her. As the shieldmaiden laughed, Anoriel felt a chill settle over him. It was the same broken laugh he heard in the desert. “Earendil, you pledged…” She looked at him. There was something in her eyes that was unsettling. “I know what I promised Anoriel. But that was not a promise made to you.” Of course. Who was the man who had changed her? She moved, fast again. He was not sure he saw how she had freed the hand that was locked between their two bodies but the shirt she wore tore, her hand had moved to her leg – the dagger in her boot of course – and the man had a blade stuck between his ribs. He let go of her bringing the torn shirt in the same move as he stepped backwards. 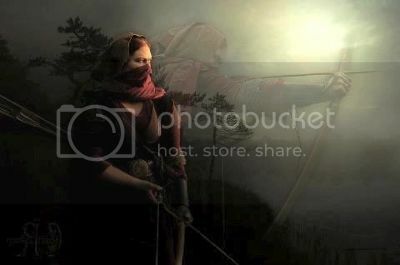 She made to retrieve her sword but the man fell, two arrows in his chest shot by Sintarano. Apparently indifferent to the cold she moved a couple of steps looking down at the man who had just tried to kill her. As she spoke though he took note of the ugly scar that ran the length of her right shoulder. That would explain why there was no bow in her weapons anymore; she once was good with it. She picked up the sword and raised it as if to strike the man again. Anoriel moved as fast as he could and in a few steps he was by her side. He took her arm preventing the woman from dropping the weapon in what was an unnecessary blow. The eyes she held towards him were veiled again. He shook his head. Her eyes followed his to the man who was taking shallow breaths. Looking at her the dying man smiled. She shuddered under his hold and forced him to let her go. She knelt and pulled the dagger from the man's chest as well as retrieved the shirt she'd worn. It would be useless now but she still put it over her shoulders for now. When she turned back to him that darkness had left her gaze but instead there was concern. His end had come, and though not by her hand, she was at least a witness to the event. With feet and hands still bound, the shieldmadien stared down at the limp body and pondered how her life would be now if their last meeting had been different. Her eyes turned to meet those of an elder dwarf kneeling beside her with a small knife in his hands. Silently she held out her bound wrists and the sharp blade easily cut through the fibers. A moment later her feet were also free and she carefully began to stand. Quickly both dwarves were by her side as she struggled to maintain her balance. But rage and vengeance can provide a focus that sometimes defies all odds. Despite the throbbing pain coursing through her veins there was one thing left she needed to do. It took only 5 steps to reach the man’s head and with a determined tug, remove the axe. Then with the strength of a broken soul claiming redemption, Rholarowyn lifted then dropped the blade of Durin’s folk and the sharpened metal found its mark. No longer was the man’s head attached to his body. Instantly, the woman toppled down to the ground following the path of the blade. Her hands sought and then found the golden, jeweled necklace and she reclaimed what was once his by placing it over her head. Finally she uttered in Eastron the curse of the dead. The man would find no honor in the Land of the Sands. “We need to get her back, back with the others.” The red headed dwarf whispered to the other who knelt down beside her. “Nayaran?” She asked urgently returning to the current reality. Together the woman and two dwarves slowly retraced the path she had been taken on; though they needed to stop many times allowing the woman to rest. The sun was just about to set behind the mountain when they eventually entered the Gates of Moria. It was there that most of the group was reunited. Had it been another time Rholarowyn would have taken the moment in with the proper respect and reverence for a place so noble, but exhaustion and relief of seeing her son running towards her that prevented her from doing so. As the woman knelt down to embrace her son, Lienoril and Anoriel quickly approached the two dwarves. All had concern etched upon their face. “She was not harmed much.” The younger dwarf quickly volunteered. “Please get Earendil for me.” Anoriel asked of Lienoril. The man silently nodded and turned away. The younger dwarf also took leave and the two leaders were now alone. She was shaking... not with the cold - she had changed shirt - nor with the feelings that had washed over her as she fought the massive Easterling. Whatever his message had meant, Anoriel knew and would not tell her yet. No she was shaking with anger; the men were here to protect her and Rholarowyn but they let her friend be taken. It probably was not fair; they were engaged in fighting too but one of them should have been standing by the shieldmaiden and prevent this from happening. They told her Eistaron was hurt trying to do just that but that did not alleviate the feelings. Or maybe it was easier to be angry than to try and understand what this man meant. They would not let her go search for the woman, asked her to stay with Nayaran as they looked for his mother. The boy was showing more restraint than she did reminding her anew that this child was old before his age. He knew exactly what to do when the fight started and he had only revealed himself after it was clear the dwarves were here to help. At that moment he was looking at Eistaron concern in his eyes; the man was lying on a pallet one of the dwarves had prepared and was looking extremely pale, much paler than the wound he received warranted. Two dwarves were also nursing light wounds that seemed to affect them more than they should. "Nayaran?" She asked the boy. "What are you thinking?" He looked back at her. He hesitated and shrugged. She understood this; he did not seem certain, he was doubting what he knew was right. She had done the same for so many days. If she had trusted herself that fight would not have been this close; she would have identified the uneasiness that dogged her as what it was. She was of the old lines - both Eldar and Edain - she should have trusted herself. "It's all right. You need to trust your instincts. Tell me." "I think the blade was poisoned. They do it at home." They did... Anger would have to wait. The boy nodded and both of them walked to Anoriel; the leader was speaking to one of the dwarves and his entire posture spoke of tension too. She realized that he was not allowed to go search for Rholarowyn either and he was extremely aware of his failure to protect the woman; all of them would be. They did not need Eari to blame them for it too; anger withered away. Bitter irony. But they needed to trust each other. "Anoriel?" She called. He turned to her and his gaze softened; that was a change from the days leading up to this one. "Nayaran was just telling me something you need to hear." The dark Gondorian looked down at the boy who was not even a shade darker than he was; they resembled each other in ways she had not noticed until now. "Yes?" He said in kind voice. Nayaran told him about the poison and Anoriel's face grew darker; he looked at her and she nodded. They both knew the boy was right. Within moments Sintarano, Lienoril and Anoriel were looking through the dead Easterlings' pockets trying to find what would be an antidote for the poison that had covered arrows and swords but to no avail. She remained with Nayaran speaking with him about the elven stone he was given; anything to keep his mind and hers away from his mother whose fate was unknown yet. Suddenly the boy stood and his face lit up; she smiled and turned as Nayaran ran towards his mother. Rholarowyn, exhausted as she looked, managed a smile as she knelt to embrace her son. Eari breathed out relieved somewhat; not all was well right now, but at least her friend was here and at least physically not harmed. She pushed herself up as Lienoril approached. The Gondorian countenance was not as antagonistic as before, or maybe it was because she had moved away from that place too. "Stay with them, will you?" She motioned to Rhoe and Nayaran. There was nothing left to fear now that they had been welcome by the dwarves but still the man nodded. "Thank you." As she reached Anoriel she realized he did not need to say anything; he was going somewhere and she was to follow. Good! She needed to be useful. Sintarano joined them and slowly they walked following the group of dwarves who were to retrieve the body of their fallen comrade. Anoriel explained in whispers they were to bring back the bodies of two fallen Easterlings to the mine. They should be no trace of them or where they went. They made it to the cave where they found her friend; the scene was bleak and anger came again. Two! They really were intent on capturing the two of them; and they had known exactly what they looked like. The beheaded man had not been standing when he lost his head. There was rage and anger in the gesture; that had been Rholarowyn's doing. For whatever reason, she knew the man and she took his head to alleviate some of the rage she had felt. "We need to find the antidote," was all Anoriel said as he knelt by the beheaded man and started looking through the man's clothes. She stepped over the body and started doing the same with the other man; the axe was still embedded in his back. She did not touch the weapon, much aware that doing so would be disrespectful to the dwarf who had thrown it. Meanwhile, the dwarves were taking care of their fallen friend. They would not touch the dead enemy, would not risk their blood be mingled with that of their comrade. Her hands ran through the dead man's pocket, his belt without finding anything of interest. There was a pouch at the belt that she opened; it held twenty silver coins, from Gondor. What did that mean? Men of the East did not carry Gondorian money; they did not care for it. Anger flared again... could it be? From within the realm? She grabbed the pouch; Anoriel would know what this meant; whether he would tell her was something else. She could venture a guess based on Sintarano's attitude but it was only a guess. And it made her angry; when would these men start telling her and Rholarowyn what this was all about. Obviously it ran deeper than they knew, but it apparently ran even deeper than the King had foreseen. "I have it." Anoriel said. She whipped around. He was holding a pouch of his own and there was purpose in his gaze. "Let us go back now." The embrace did not last long as Nayaran pulled back. “Mom, they need your help!” The boy grabbed her hand and once Rholarowyn had risen to her feet together they made their way to a small secluded room that had been carved further back beyond the entrance of the mine. Lienoril followed. Once inside, the shieldmaiden noted the many torches hanging on the wall providing more light than normal. There was a small circle of dwarves huddled around two of the bodies and a third that was unattended to and lay off to the right. No explanation was needed as the woman quickly assessed the situation. In the middle of the room was a small pile of various items all of which had been dumped from the Easterling pouches and bags that now lay discarded close by. Without hesitation she moved to Eistaron who breathing was labored and skin was cold. She ignored the pain of her torn and weary muscles as she knelt down and pulled back the wool blanket which revealed the source of the problem. He had been shot by an arrow which had dug its way deep into his right shoulder. “What has been done for him so far?” The woman asked looking up at the Gondorian. Removing the corks and taking a cautious smell Rholarowyn spoke. “They did not hurt him but they did not help him either. Nayaran, get the bag from my saddle.” The boy instantly left the room. Spinning around the woman almost lost her balance and Lienoril quickly caught her arm and helped her up. “They were cut by the blade of a sword.” Again the woman knelt down but did not get to close. Both dwarves were conscious but the larger one on the left had begun to hallucinate. His comrades were doing their best to control him. “Here on his neck.” Answered the first dwarf. “He was sliced on the arm.” Came another reply. The three dwarves turned to the woman with a look of disbelief upon their faces. “What?” She asked rising to her feet. The dwarves huddled for a moment, discussed shaving off half the beard, and then came to an agreement. They would attempt to shave the entire beard off, though only after he was sedated. 30 minutes passed as the shieldmaiden worked efficiently as she could with the items available though the addition of her saddle bag was helpful. She thoroughly evaluated the wounds of all three and attending to them with the herbs and creams she had been able to make from her supplies. She moved between the three men with a dedicated focus that allowed her block out all other thoughts and distractions. Her hands could slow the poison down but it would not stop its progression, Hopefully the ohers would find the antidote before it was too late. When she had done all that she could do the woman finished with Eistaron and once again knelt down beside him. Rolling back the dusty green blanket she gently she placed her hand upon his bare chest. “I am not hungry.” The woman replied in an emotionless tone. The Gondorian looked at the boy again with a nod of his head. Nayaran carefully left the room. “What is it?” Lienoril asked as he knelt down beside the woman. “I do not know,” she answered sitting back upon her feet which allowed her to now rest against the stone wall. “His wound is much deeper, though the others may be affected by a lesser poison.” Closing her eyes she then leaned back and let the wall support her head. “His fate may be determined elsewhere…beyond the range of our help.” she added. Deciding it was the exhaustion talking, the Gondorian began to examine the woman. It was then, while she was resting that he noticed the blood spatter upon her tunic and across the tanned skin of her face. It was not the blood of those she had been treating. Looking down he then noticed the leather bound necklace that was hanging around her neck. It too had some tiny tiny droplets and larger areas of dried blood covering the gold beads. There was a sectioin where Some of the precious stones were entirely coverd as well as the leather cord. In the days of his past he had not cared much for Rholarowyn of Gondor and though their paths did not cross much he suspected the feelings had been mutual. Added to this was his brother’s willingness to leave all he had worked for, including his post as the Captain of the Pelargir Guards, to follow a reckless rumor that she may have still been alive in the East. Once all thought he too had perished in the East, his dislike for the female warrior was fueled even more. Yet as he leaned back beside her on the wall and knowing that now Bandoril was indeed alive, he momentarily tried to imagine what her life must have been like. The successes and failures, the pain and the loss, the almost obsessive need vindicate her father’s death and then moving onto the larger battles of fighting for the side of good over evil by joining the Mithril Knights. In the end he began to realize he felt a small yet growing respect for this woman. His mind then turned to his brother, Bandoril, the diplomat, who he hadn't seen in 5 years and had always held the shieldmaiden in high regard. There was a true fondness and affection between the two and his brother's favor always esteemed her, valued her, and when he could, protected her. Perhaps their fondness began after her cousin’s Boromir’s death. Drawing in a deep breath Lienoril then pondered what his brother would do now, if he were here, in this very place next to her. How would help her…how would he comfort her…how would he encourage her. Suddenly a single tear escaped from her closed eyes and began to stream down her cheek. “Rholarowyn,” he finally whispered wiping the tear away. He could not have known that his brother had once done the very same thing and because this was so, there was no resistance in her soul as she leaned in towards his chest and sought comfort in his strength. He placed his arms protectively around her while she reached out with her right hand and pushed it under the blanket that was covering Estaron. It came to rest upon his chest just over his heart, it was her silent plea for him to hold on. The women nodded slightly as she felt the Gondorian gently stroke the long; lose strands of blonde hair away from her face.